Explore Shanghai number one for China Travel apps! One of my favorates! Super useful. The time estimated is quite accurate. I always check it before I go. Explore Shanghai is available now on the iTunes App Store priced at just $0.99. Download now! This entry was posted in iPhone, shanghai on April 26, 2010 by matt. Shanghai and Singapore iPhone apps updated to 2.0 – now in landscape! The latest updates to our iPhone apps have just been approved by Apple. The Explore Singapore 2.0 update includes the new Singapore MRT Circle Line stations which opened last week, while the Explore Shanghai 2.0 update includes the latest extensions to Shanghai Metro Line 7 and Line 10. Another new feature debuting with 2.0 is landscape mode. Since the iPhone screen is quite small, it can be hard to see the whole metro map at once. Now if you tilt your iPhone to the side, the app will automatically use landscape mode, and the status bar and tab bar will be automatically hidden, to give you the maximum space for the map! Just tilt back to portrait if you want to access other features like search and “find my nearest station”. We’ll be updating our other city apps, for Guangzhou, Hong Kong and Beijing to support landscape mode in the next couple of weeks! This entry was posted in iPhone, shanghai, singapore on April 23, 2010 by matt. You must have a valid Expo ticket to ride Line 13. Rides are free. The line will operate from 09:00 to 24:00, the same as the opening hours for the Expo park. Trains will run every 6 minutes. At Madang Road, you’ll need to exit the Line 9 station and follow signs to the Expo entrance. Then you’ll undergo security checks and have your ticket checked before being allowed to board the train. You can also use Line 13 to hop between the Puxi and Pudong parts of the Expo Zone by travelling between Lupu Bridge and Shibo Avenue: this is free with an Expo ticket. There are additional entrances to the Expo zone accessible on foot or by shuttle bus from these stations: West Gaoke Road (Line 6/7), Houtan (Line 7), Changqing Road (Line 7), Yaohua Road (Line 7/8), and South Xizang Road (Line 4/8). These stations are outside the Expo Zone though, so you will have to pass through security after leaving the metro station. After the Expo ends, Line 13 will close until 2011, when it will reopen with additional stations. We’ve updated our online Explore Shanghai metro map to add the new line, and an update to our iPhone app will be available in the next week. This entry was posted in expo, newlines, shanghai on April 22, 2010 by matt. PDF maps for Beijing, Guangzhou, Hong Kong, Singapore and Shanghai! We’re delighted to announce new PDF maps for all our ExploreMetro cities! Now you can print out and carry a handy A4 printout for Beijing, Guangzhou, Hong Kong and Singapore, besides the Shanghai map we already offered. To download the maps, just click on the “PDF map” tab on any of our city sites, or follow the download links below. The PDF maps are available in both English and Chinese versions. If you have any feedback or spot any mistakes on the map, do get in touch! This entry was posted in beijing, guangzhou, hk, shanghai, singapore on April 19, 2010 by matt. The Shanghai Metro company has announced that Houtan station on Line 7 will open tomorrow, 20 April. The station is very close to the Expo site and has been closed for construction since Line 7 opened earlier this year. Its located on the Pudong side of the river, between Changqing Road and Chuanchang Road. We’ve updated our online Explore Shanghai metro map to add the new station, and an update to our iPhone app will be available in the next week. This entry was posted in newlines, shanghai on April 19, 2010 by matt. The Singapore MRT Circle Line was extended today. Previously the line ran from Marymount to Bartley, the new extension loops through central Singapore all the way to a 3-way interchange at Dhoby Ghaut. There’s also a new interchange with the East West Line at Paya Lebar. Trains will run every 5 minutes, or up to every 3.5 minutes at peak times. We’ve updated our exploresg.com online map with the latest stations. An update to our Explore Singapore iPhone app will follow soon! This entry was posted in newlines, singapore on April 17, 2010 by matt. Explore Shanghai for iPhone 1.8 released! We’re pleased to announce the launch of Explore Shanghai metro map version 1.8 for iPhone. We’re dedicated to bringing you the most up-to-date and accurate metro map of Shanghai, and this latest update adds all the new lines and stations including Line 10, and the Line 2 extensions to both Hongqiao and Pudong Airports. We apologise for the slight delay in getting this update out: with new lines opening frequently, and an approximate 5-day approval process from Apple, we’re going as fast as we can 🙂 This is the ninth version of Explore Shanghai since we launched late last year! Version 1.8 is a free upgrade for existing users: just look for a notification on the App Store to update. Not bought Explore Shanghai yet? It’s just $0.99. Go get it now! This entry was posted in iPhone, shanghai on April 14, 2010 by matt. Our iPhone metro map apps are great, but sometimes you want a map you can print out! We’ve updated our popular PDF maps of Shanghai with all the latest lines and stations. This entry was posted in shanghai on April 13, 2010 by matt. As we reported on Tuesday, Shanghai Metro Line 10 will open on Saturday. Here’s what you need to know. This brings the total length of the Shanghai Metro system to 420km: the longest in the world! Line 10 will initially open for trial operation for 2-3 weeks between the hours of 9am to 4pm, avoiding the rush hours. – UPDATE – Now 5.30am to 7.30pm! At the western end of the line, there are two branches, to Hangzhong Road and Hongqiao Airport. The Hongqiao Airport branch will open later in the year. The trains on Line 10 are designed to operate without drivers, but there will be drivers on board for the trial operation. The line passes many of Shanghai’s tourist attractions, such as Yuyuan Garden, Xintiandi and East Nanjing Road. 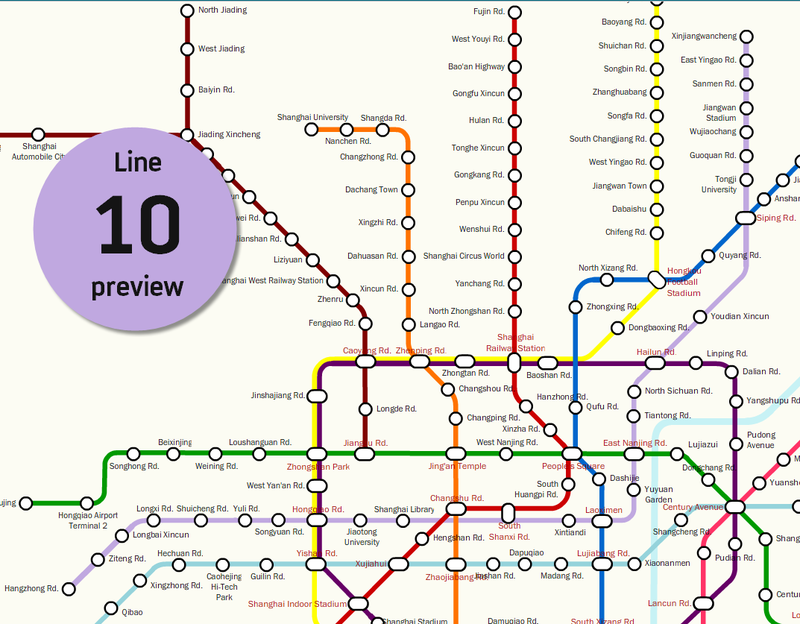 Line 10 will also include the first metro stops servicing the Gubei area. Line 10 trains and stations have a lilac livery. That’s a light purple! The Shanghai Metro Company promise 108 bus lines servicing the new metro stations! Here are the stations on the new line, from west to east. This entry was posted in newlines, shanghai on April 9, 2010 by matt. The Shanghai Metro company has announced that the Line 2 eastern extension to Pudong International Airport will open for trial operation on Thursday 8th April. We can also exclusively report that Line 10 will open for trial operation on Saturday 10th April! Trial operation means limited opening times, approximately 9am to 4pm avoiding the morning and evening hours. Expect the lines to switch to full-time operation in a few weeks. The new Line 2 extension stretches from the current terminus at Guanglan Road all the way to Pudong International Airport. The airport station is located between Terminal 1 and Terminal 2. For the first time it will be possible to travel by metro between Pudong and Hongqiao Airports. Note that all passengers will need to change trains at Guanglan Road. You heard it here first, Line 10 will be opening this Saturday! However, again the opening times will be limited initially to 9am to 4pm, and only the central portion of the line will be opening: the westernmost stations at Hongqiao Airport, and the north-eastern part of the line will not be opening yet. We’ll provide a full list of stations set to open as soon as the official announcement is made in the next few days. This entry was posted in newlines, shanghai on April 7, 2010 by matt.